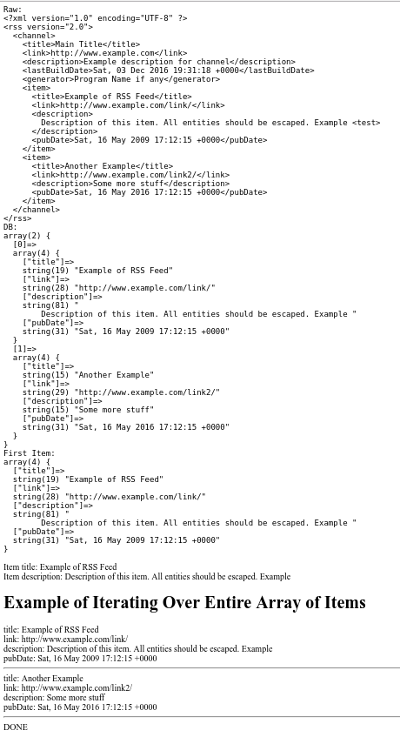 There is an XML header followed by the rss tag an optional channel tag and then the item tags. The item tags are what we are most interested in as they have the RSS feed information you will want to look at. Typical entries are title, link, description and pubDate. There may be other tags as well but these four are the most used. The 'constructor' takes up to three arguments. $data is a string, either a filename or raw data. $isfile is true if the string in $data is a filename and false if it is raw data (defaults to true). $savedata is true if you want to save the raw XML and false if you don't (defaults to false). The 'getDb' method takes not arguments, it returns the array of the item tags and their children. You can look at this array with var_dump($returned) to find the elements you want to look at. The 'getItem' methode take one integer argument, the item index. It returns a sub-array of the elements under the item tab. The 'getRawData' method returns the raw XML. // This is the raw XML from the site. // This is the item array. Array element '0' is the first <item> etc. // This gets the first <item> as an associative array. // To display items just do $item['title'] etc.